The Wages of Wins Network has been putting on a contest. If you can guess the individual performance before the end of the season you could win an awesome BounceX3 t-shirt, from BounceX3. The current leader is Matt Bailey (@hoopisms) from hoopism.com with the amazing pick of Kenneth Faried on April 9th against the Golden State Warriors. This game was truly spectacular with 27 points and 17 rebound performance from the Nuggets rookie. Even more extraordinary is that he did this in a mere 24 minutes of play. I thought I’d pull out the 50 best games so far this season and share some cool stories from them. Spoiler alert, Faried stars in a few. There have been 851 games played and in each of those games roughly 10-12 players from each side suit up. That means have a top 50 game would put you in the 99.4 percent. Of course, some players have managed to achieve this feat multiple times this season. Yet again Faried puts himself on an impressive list. Who knows, by the time the season is over maybe he’ll be at 3 or 4 as well? In fact, talking about short time frames, there’s yet another impressive list for Faried. There have only been four players aged 22 years or younger this season to post a top 50 game. Guess who shows up? On the other end of the spectrum, only two players over the age of 35 managed to make the list. Guess who else shows up? The best player is defined using Points over Par, which is the points variant of Wins Produced. In short, it tells you how many points above an average player your player was responsible for. In exact terms it tells you the exact number of points in your team’s margin of victory (or loss) that your player is responsible for. 10 Responses to "Faried is a beast and other lessons from the top 50 games of the season"
Hey, which team has the most Top 50 games this season? Interestingly, the New Jersey Nets, with 5 (2 D-Will, 2 Kris Humphries, 1 Gerald Wallace). Odd that a team with such a bad record has so many Top 50 games. Faried’s game last night was amazing. 27 points and 17 rebounds in 24 minutes? Better put that guy back on the bench. Al Harrington needs his touches! 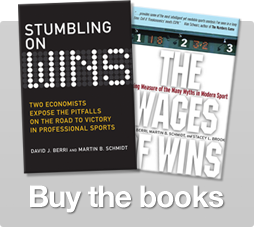 The reason I was drawn to sports economics in the first place is the way it provides a microcosm of the way people in all sorts of businesses make decisions – just with a lot more transparency and data. …and I remember why I don’t take anything too seriously.